On Tuesday, February 27th the Fillmore Flashes Girls Soccer team hosted Rubidoux High School and defeated them with a final score of 4-1. This win allows the Flashes to advance to the CIF Championship Finals, which will be announced at a later time. Game highlights: Valerie Hernandez had 2 goals and 1 assist, Yareli Vasquez and Ana Covarrubias each had a goal. Yanely Cobian, Emily Garibay, Kayla Martinez, and Alexsis Mejia played well defensively. 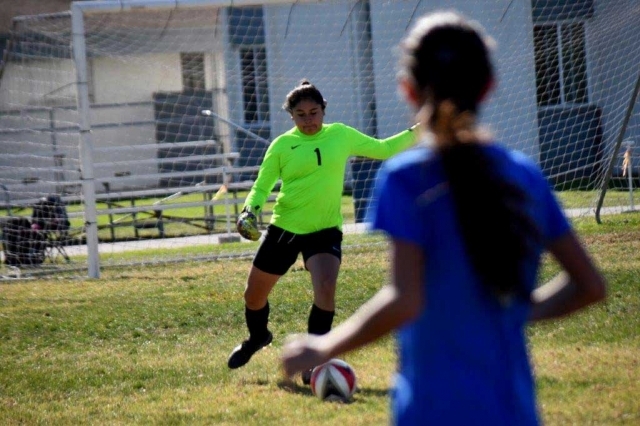 Aaliah Lopez had 4 saves on goal. Courtesy Coach Omero Martinez. Submitted by Coach Kellsie McLain. The Flashes Varsity Softball team started off the season with victories over Village Christian (2-0) and Heritage Christian (7-5) in the Lincoln High School Classic tournament. Against Village Christian Kasey Crawford went 2 for 3 with two singles, Lindsey Brown went 1 for 3 with one single and one RBI, and Cali Wyand went 1 for 3 with one single and one RBI. Winning pitcher Sydnee Isom had a strong performance, ending the game with a total of 9 strikeouts. Against Heritage Christian Lindsey Brown went 2 for 3 with two singles, Maiah Lopez went 2 for 3 with a single, a double, and two RBIs, and Freshman Janeah Castro went 1 for 2, hitting her first high school homerun and earning 3 RBI’s. Ebony Venegas and Audrey Clay also contributed to the Flashes offense with an RBI each. The Flashes JV softball squad went 1-1 for the day, defeating Chatsworth 6-3. California United’s Marlene Gonzales leads the attack versus Oxnard National with teammates Kari Terrazas and Jessica Rodrigues running the wing during this past Saturday’s game. Photo Courtesy Martin Hernandez. 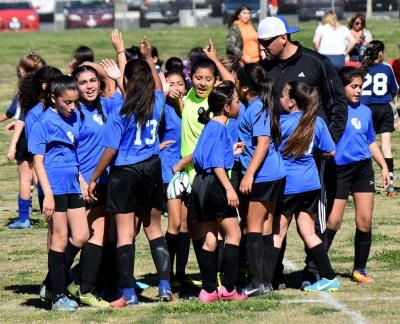 Coach Lomeli and the California United U-12 Girls getting a break after their win at home against Oxnard National. Photo Courtesy Martin Hernandez. 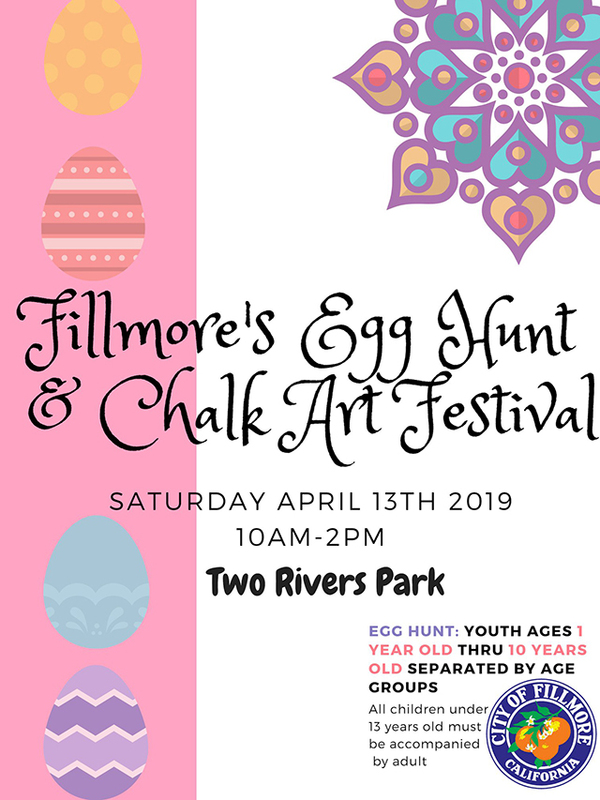 This was a big weekend for California United Soccer who hosted there first home games as a club with 5 of six teams playing at Two Rivers Park and ushering in a new era for Fillmore club soccer. Starting the day for California United the U-10 girls took on the Oxnard Waves. It was a tough first half ending in a 1-1 tie off, with a laser of a shot from Lisbeth Mendez on the assist from Jiselle Posadas. The second half was very close until the end when Oxnard let loose making 3 quick goals ending the in a final score of 4-1 oxnard. This was a great game versus a long standing club team for the young squad as they continue to develop. 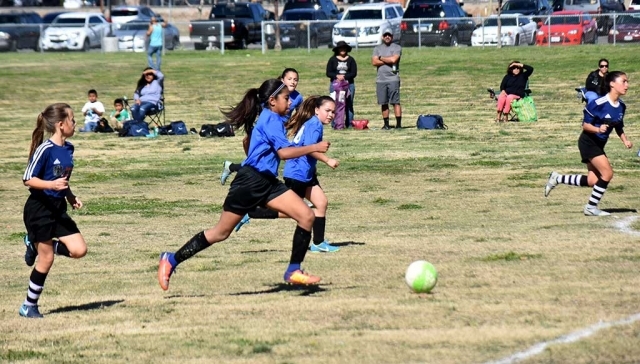 Next the U-12 girls took on Oxnard National and came out on top winning 4-2. California United came out very aggressive and attacked the defense for two quick scores, one by Marlene Gonzales and the other by Jadon Rodriguez. After National scored a goal to cut the lead in half, Marlene scored her second goal of the day just before halftime to make it 3-1. After an auto goal against California United Kari Terrazas scored on a nicely set up pass from Jadon Rodriguez for the final score of the day. The U-13 boys really like playing at home as they looked great in an 8-0 victory over the Piru Chivas. This was an all-around team effort as Ivan Espino who scored 2, with the following players all scoring one goal each; Aldo Garza, Lizandro Orozco, Alexander Roque, Mathew Tello, Alonso Murillo and Fernando Pastrana whom had two assists for his team. The defense looked solid all game long with Eugenio Serna recording the shutout as goalkeeper. The U-14 girls also had a strong outing as they beat the Pumas 5-1. 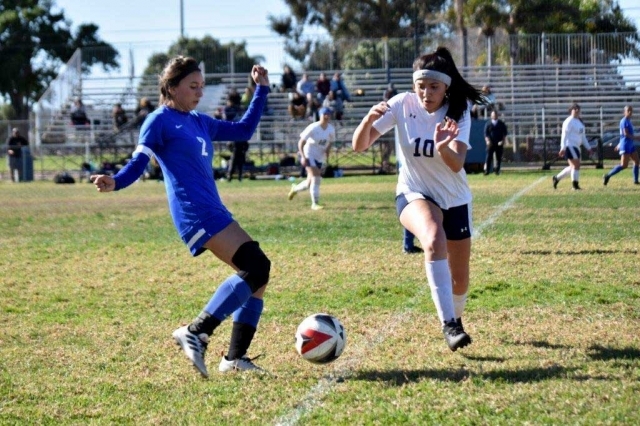 Isabela Regalado had 2 scores for California United while Jenny Abrego, Daisy Jimenez, and Valeria Jaimes each had one. 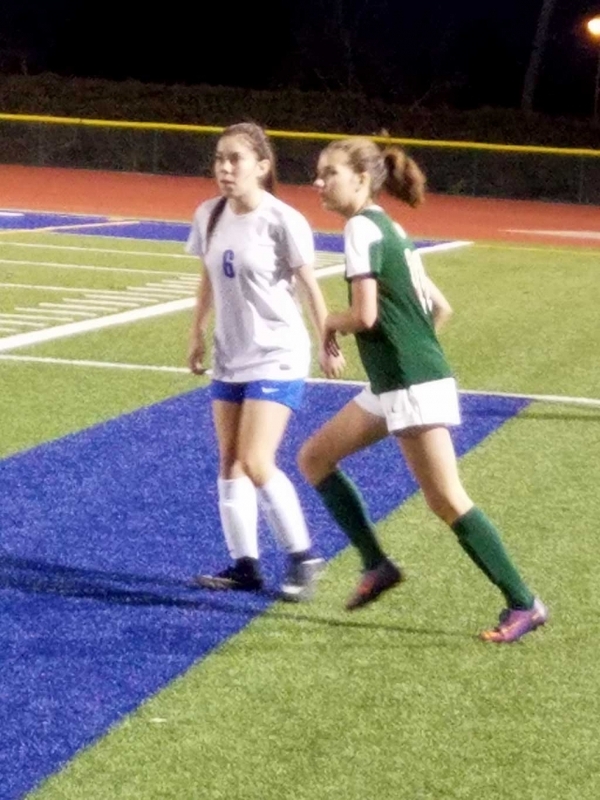 There was plenty of passing in this game as Daisy Jimenez had 2 assists, with 1 assist each to Jenny Abrego, Valeria Jaimes and Emily Garcia. Finally, The U-14 boys took on the Lobos in a very tightly contested match which ended in a 0-1 loss for California United. This was a great game throughout that saw a lot of back and forth and could have gone either way. We look forward to hosting more California United home games in the upcoming weeks, so make sure to follow us on Facebook for info on days and times to come out and support these great local athletes or if interested in joining. California United U13 Boys: 8 -0 Chivas Piru; Ivan Espino (2), Aldo Garza (1), Lizandro Orozco (1),Alexander Roque (1), Mathew Tello (1) & Alonso Murillo (1) & Fernando Pastrana (1); Assit by: Fernando Pastrana (2) Goalie Eugenio Serna recorded a shut out. 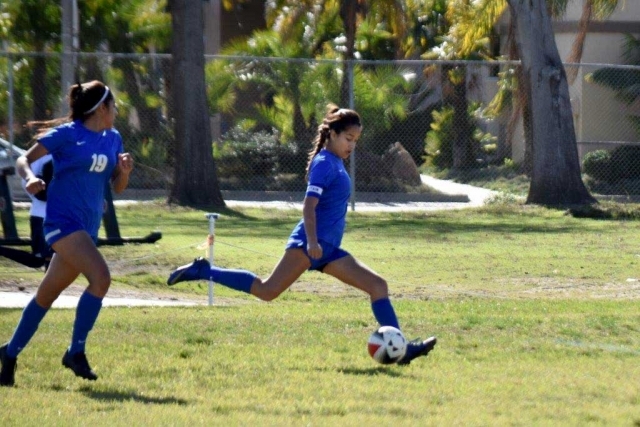 California United U14 Girls: 5-1Pumas; Goals by Isabela Regalado (2), Jenny Abrego (1), Daisy Jimenez (1) & Valeria Jaimes (1); Assist by: Jenny Abrego (1), Valeria Jaimes (1) Emily Garcia (1) & Daisy Jimenez (2). California United U14 Boys: 0-1 Lobos. The Lady Flashes advance to the CIF third round where they will play Anaheim High School at 7PM in Anaheim this Wednesday February 21st. 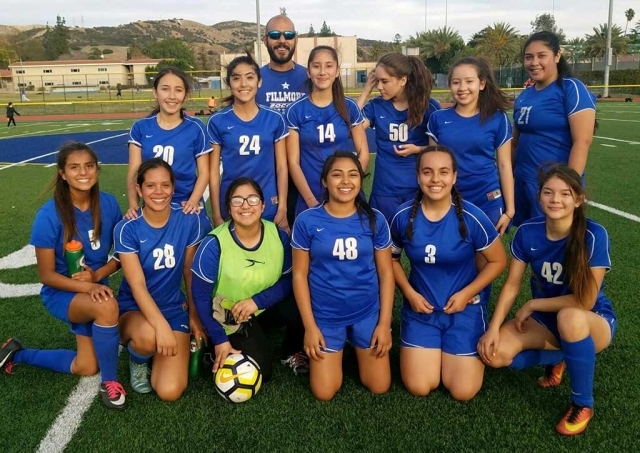 Congratulations our Fillmore Flashes Varsity Girls Soccer Team who took second in the Frontier League this year. 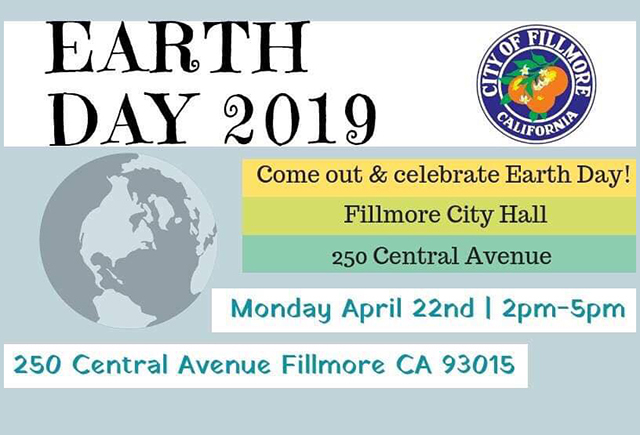 The Fillmore Citizens Patrol Flashes will host St. Monica Catholic for the first round of CIF on Thursday, February 15th at 5:00PM. 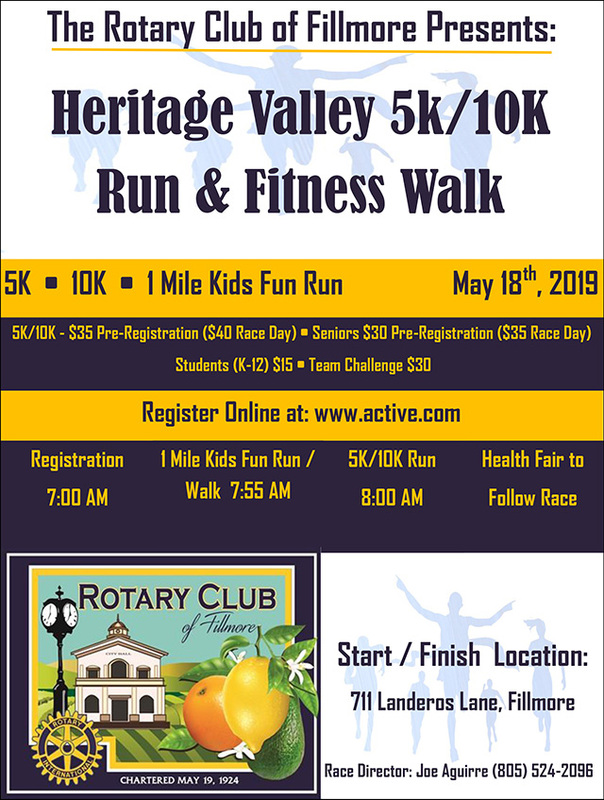 Come out and Support the Lady Flashes! Pictured top row l-r: Coach Frank Garibay, Ashley Yepes, Andrea Marrufo, Tori Villegas, Shania Leon, Sohia Garibay, Anahi Andrade, Aaliah Lopez and Coach Omero Martinez. Middle row l-r: Kayla Martinez, Emily Garibay, Lupita Rovalcaba, Aaliyah Alfaro, Alexis Mejia, Yareli Vasquez. Bottom row l-r: Ari Magana, Valerie Hernandez, Lupita Bravo, Yanel Cobian, Alexys Covarrubia, Ana Covarrubia and Jennifer Cruz. Courtesy Coach Omero Martinez. Congratulations the Flashes JV Girls Soccer for the Frontier League Championship Title for the second year in a row, great job players and Coaches. Pictured top row l-r: Coach Yazu Meza, Jacqueline Ruiz, Viviana Ruiz, Sadie Rico, Nataly Gonzalez, Natalia Mejia, Coach Jennie Andrade. Middle row l-r: Sophie Pina, Isabella Vaca, Ariana Ocegueda, Noelani Sanchez, Celialina Solis, Julissa Martinez. Bottom row l-r: Cecilia Cisneros, Sabrina Belat, Andrea Perez, Luisa Palmenn, Leslie Ramirez, Laura Avila, Briana Lopez. Courtesy Coach Omero Martinez. The boys came up short in this contest, leading for Fillmore Daniel Gonzales, 16 points, 13 rebounds, 1 assist, 7 blocks, 3 steal; Roy Esquivel, 14 points, 2 rebounds, 1 assist, 1 steal; Gregory Kraft, 9 points, 2 rebounds, 1 steal. The boys lost a tuff league game at home, losing 54-57. They had chances throughout to win it, just came up short, missed opportunities and foul trouble cost the Flashes the chance to secure 2nd place in league. They battled to the end, came up short. Leading for Fillmore Daniel Gonzales, 11 points, 9 rebounds, 1 block, 1 steal; Roy Esquivel, 13 points, 3 rebounds, 3 assists, 2 steals; Jake Saviers, 9 points, 6 rebounds, 5 assists, 2 steals; Junior Maldonado, 9 points, 3 rebounds, 4 assists, 2 blocks. The boys started and battled throughout this contest. Only down 8 at half, just ran out of gas in the second half eventually losing to the league champs. With this loss , Fillmore eliminated themselves from playoffs, finishing 4th in league, but it does not take away what the boys did all year, and the work and learning they did. They had a good season, regardless of the final record, leading for Fillmore Daniel Gonzales, 17 points, 17 rebounds, 1 assist, 1 block, 2 steals; Junior Maldonado, 11 points, 3 rebounds, 1 assist, 1 steal; Roy Esquivel, 8 points, 5 rebounds, 3 assists, 1 steal; Jake Saviers, 6 points, 7 rebounds, 1 steal. Flashes finish 5-5 in Frontier League, 7-15 overall. 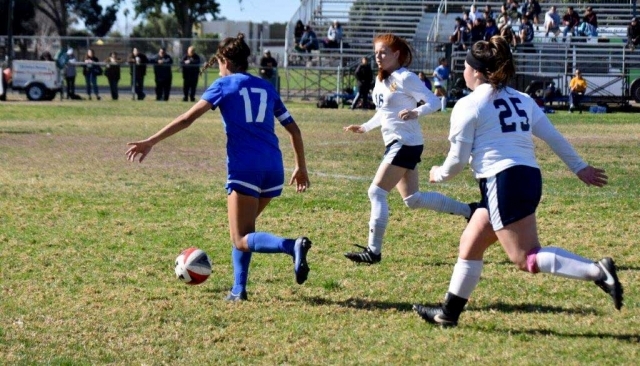 California United’s Ashley Hernandez controls the ball in the opponent’s box at Saturday’s game. Photos Courtesy Evelia Hernandez. 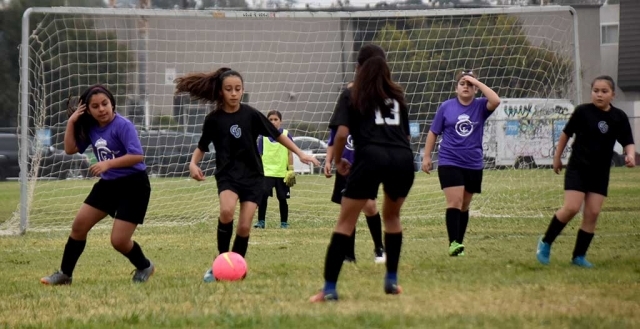 Saturday, February 10th California United U10 Girls took on Oxnard Real, but fell short after a close game with a final score of 2-3, California United player Sara Diaz had both goals that game. California Untied U12 Girls also took on Oxnard Real and defeated them with a final score 6-0. Goals: Karissa Terrazas 1, Victoria Piña 1, Marlene Gonzalez 4, Shutout goes to Mikayla McKenzie. 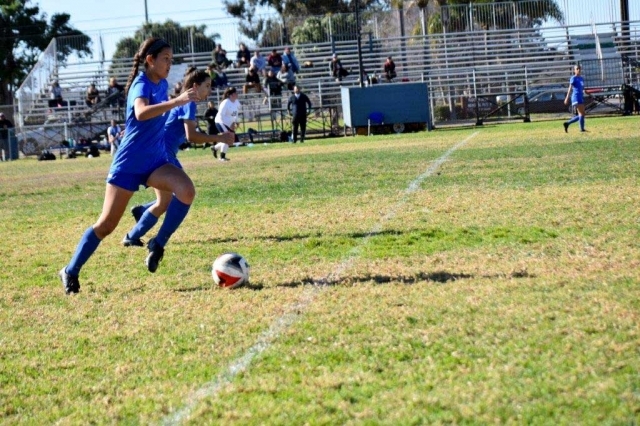 California Untied U14 Girls took on MSA United as well this past week and defeated them 1-0. Goal: Isabella Regalado. California Untied u13 Boys team fell short this past weekend to with a final score 1-0 against the Tigers. California United U14 Boys also fell short this past week after a tough loss to the Xolos with a final score 0-1. Congratulations to California United! They were named the 2017 Sports Group of the Year. Pictured (l-r) U10G team-Coach Johnny Cabral, U14G Team Head Coach Nico Jaimes, U13B team- Head Coach Alex Melendez, U12G Team-Head Coach Jr. Lomeli, Assistant Coaches Tony Hernandez, Cip Martinez and Ruben Rodriguez and their teams smiling as the received their award for as 2017 Sports Group of the Year (Not pictured: Head Coach David Vaca (not pictured) U148B team-coaches Javi Alcaraz and Damian Magana). 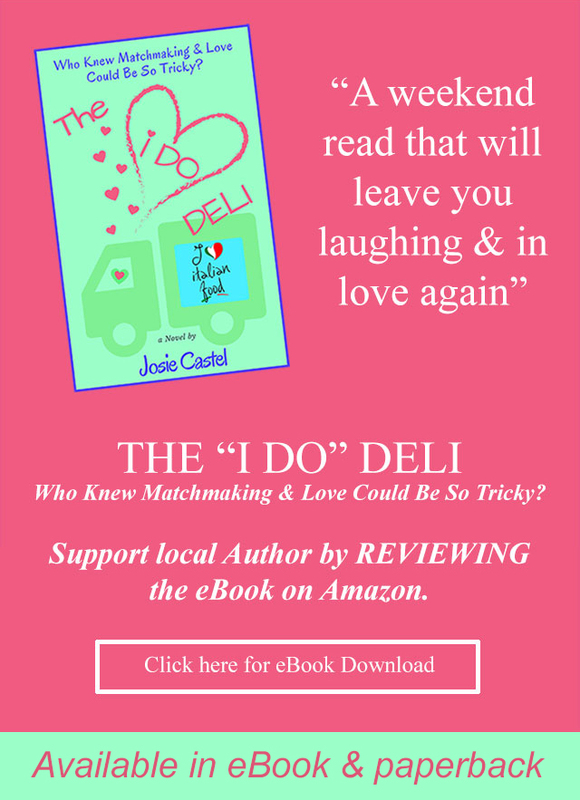 They will be honored at the Fillmore Chamber of Commerce Community Awards Dinner on Friday, March 30, 2018. 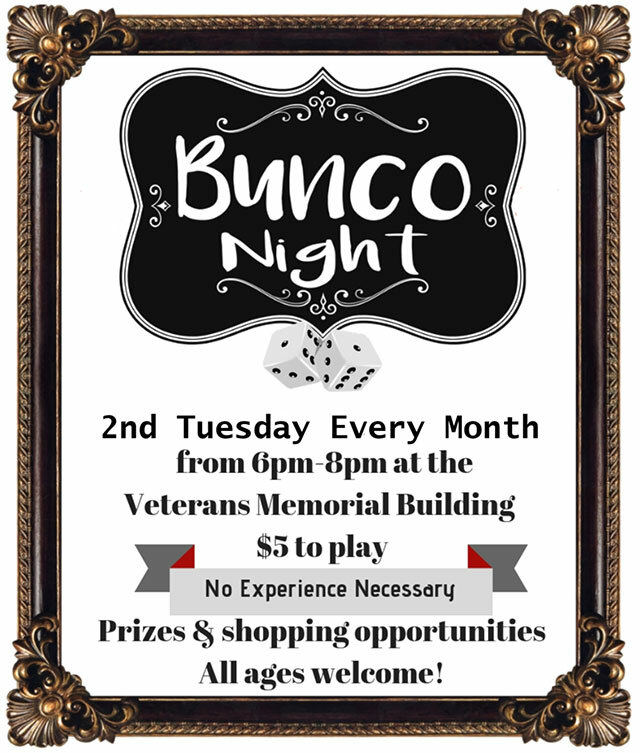 Starting at 5:30pm. Tickets are $30. Ernie Villegas will be returning as the master of ceremonies. Questions:805.524.0351 This year’s theme, 1980s! Submitted By Coach Omero Martinez. Fillmore traveled to Thacher on Monday, February 5th. Both JV & Varsity came out ready to play. Varsity missed a few opportunities in the first half, but made up for it in the second half coming back with four goals. Ana Covarrubias had 2 goals and 2 assist. Anahi Andrade had 1 goal, Andrea Marruffo had 1 goal and assist. Final Score 4-1. JV continues there winning ways with a 5-0 victory. Goals were scored by Isabella Vaca (2), Celi (2) and Sophia Pina (1). Great job!!! 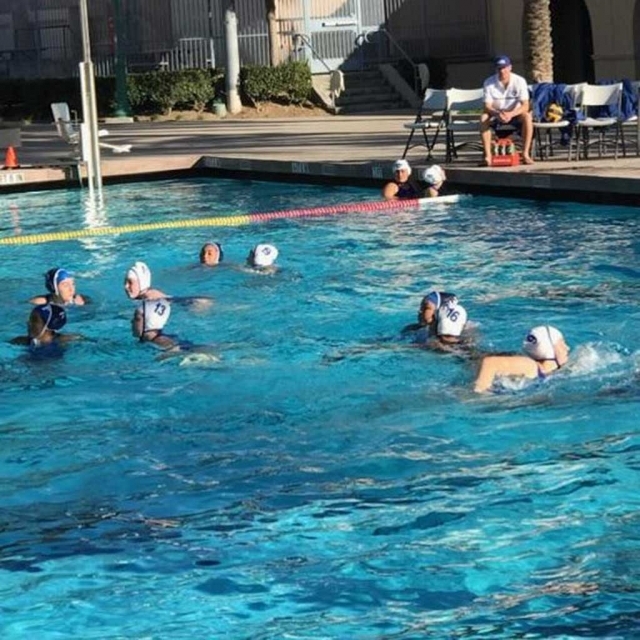 On January 31st Fillmore High School Water Polo took on long time rival Santa Paula High. 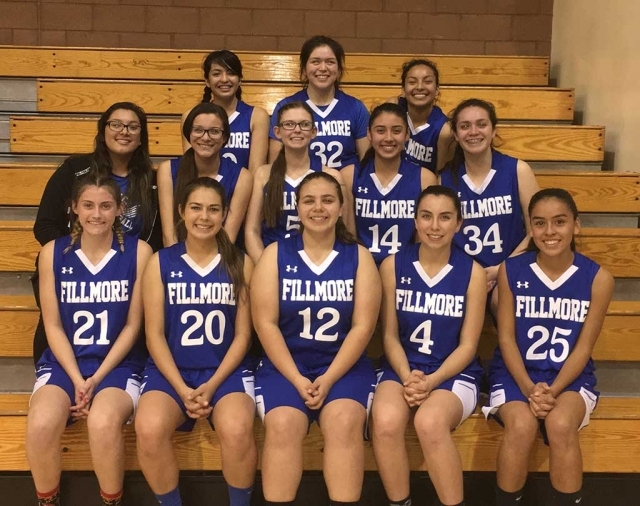 Fillmore’s Varsity short 18 – 4 as well as JV 13– 0. Submitted By Coach Lindsey. On Saturday, January 27th Fillmore’s California Untied U-10 Girls took first place in the Ventura County Soccer Club Championship. Pictured top left: Alondra Leon, Coach David Vaca, Fiona Cabral, Valerie Rubio, Delila Ramirez, Lizbeth Mendez, Jazleen Vaca, Danna Castillo. 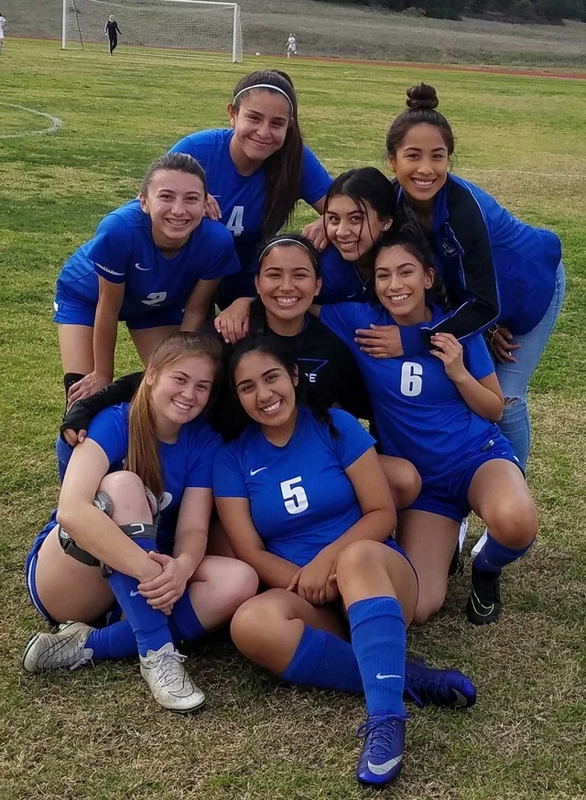 Bottom left Joelle Rodriguez, Sara Diaz, Nathalia Orozco, Anel Castillo, Liana Lomeli, Eliana Tello, Jiselle Posadas, Hailey Robledo, (not pictured D’andra Amezcua, Assistant Coach John Cabral). Photo Courtesy Nancy Magana & Susan Torres. 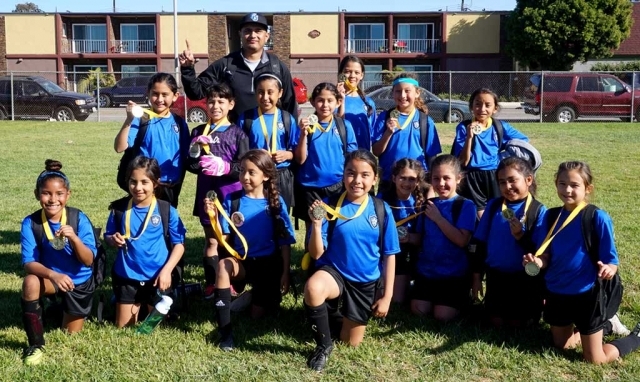 This past Saturday the U-10 girls, in their first ever tournament, played great and started their California United careers with a Championship at the Ventura County Soccer Club Tournament this past weekend. The game started off deadlocked as both teams went back and forth on the attack with neither side able to put it in the net. The first goal of the game was put in by Alondra Leon off an assist by Lizbeth Mendez. Sealing the game with the second and final goal of the game was Sara Diaz, making the final score 2-0 for California United behind a great defensive shutout with Fiona Cabral as goalie. This was a two weekend tournament in Oxnard with the semis and finals this past weekend as a run up to the start of the Spring Season. The U-10 girls are officially off and running on the local soccer scene. Only a few months from the time the team was assembled these ladies have put the county on notice, they are ready to compete right now. Congratulations to the coaching staff and good luck to the entire California United family of teams as we look to kick off the Spring Season in the next couple of weeks. The boys started strong in this game, just couldn’t finish the game off. Leading for FHS Daniel Gonzales, 19 points, 6 rebounds, 2 assists, 1 block , 1 steal; Roy Esquivel, 8 points, 3 rebounds, 4 assists, 1 steal; Jake Saviers, 6 points, 6 rebounds, 2 assists. The boys started off well, played a good game to bring home the victory at Villanova. FHS outscored Villanova each qtr, played well in the full court press. Leading for Fillmore Daniel Gonzales, 23 points, 12 rebounds, 3 steals; Junior Maldonado, 14 points, 5 rebounds, 1 assist, 1 steal; Jake Saviers, 7 points, 8 rebounds, 3 assists, 1 steal; Ian Morris, 5 points, 6 rebounds, 1 assist, 1 steal. Flashes are now 6-12 overall, 4-2 in Frontier League. 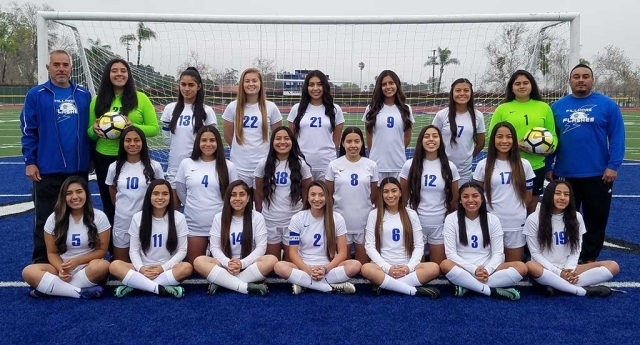 (Above) The Fillmore Girls Soccer Frosh Team as they smile for a picture after defeating Carpinteria 4 – 0 this past Monday. Photos courtesy Coach Omero Martinez. Saturday, January 27th Fillmore Flashes traveled to Nordhoff. 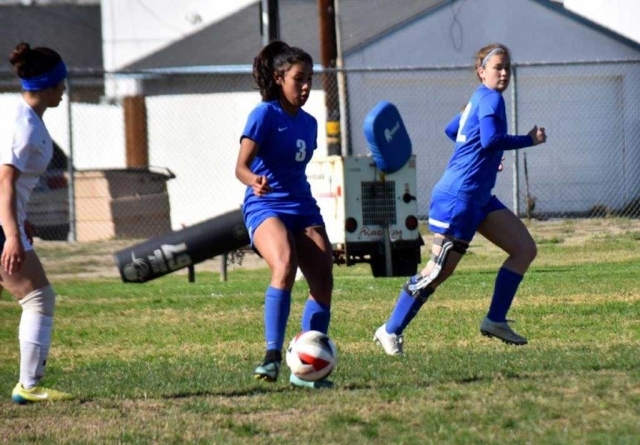 Fillmore’s JV defeated Nordoff 2 – 0. Flashes Varsity fell short to Nordhoff 1 -0 in overtime. Monday, January 29th Fillmore hosted Carpinteria. Flashes Frosh came out strong and set the tone for the rest of the team's. They dominated with a 4 - 0 victory. Goals were scored by Nicole Gonzalez, Yanely Lara and Vanessa Avila. 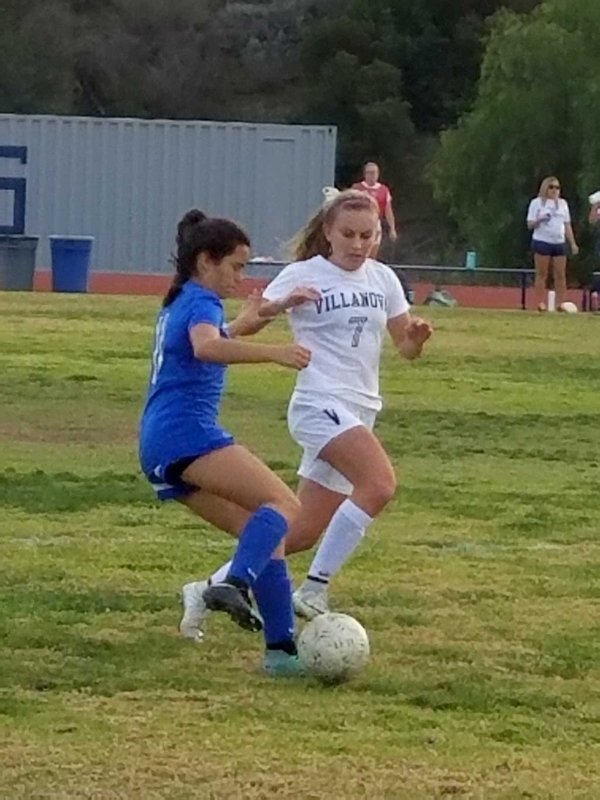 JV defeated Carpinteria 2 – 0. Goals were scored by Luita Bravo. 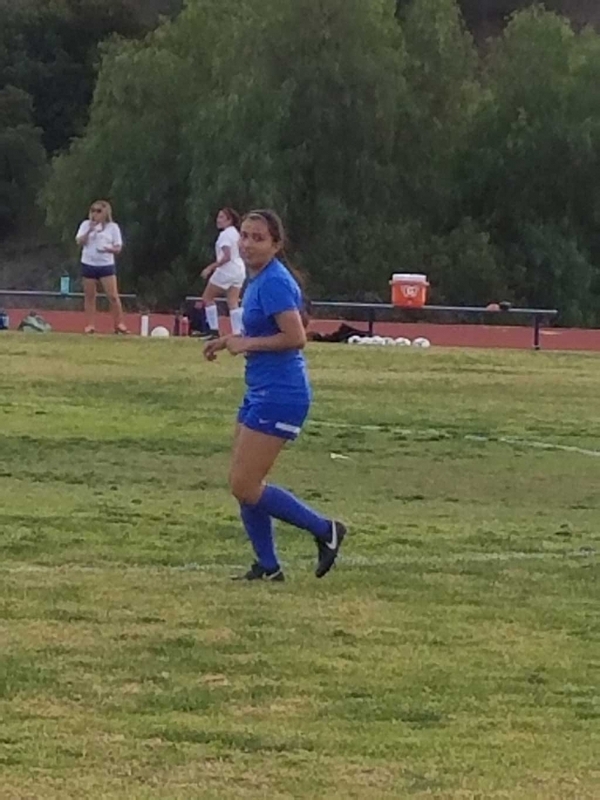 Flashes Varsity’s Ana Covarrubias had 2 goals 1 assist. Valerie Hernandez had 1 goal 2 assist. Andrea Marruffo and Lupita Ruvalcaba had one goal each. Kayla Martinez, Yareli Cobian, Emily Garibay and Sophia Garibay played well defensively. They only allowed 4 shots on goal. Tuesday, January 30th Flashes Varsity traveled to Villanova and won 10-2. 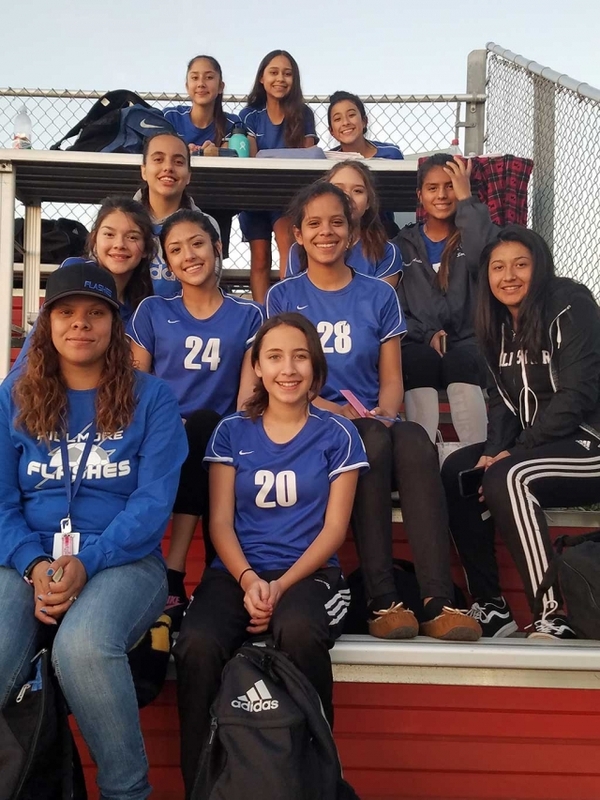 Goals were scored by Ana Covarrubias, Anahi Andrade, Valerie Hernandez, Andrea Marruffo (2) Lupita Bravo (2), Tori Villegas, Lupita, Cruz and Susie Garcia. Come out and cheer on the Lady Flashes on Wednesday 2-7-18 as they take on Cate. JV begins 4:30pm, Varsity 6:00pm. Submitted By Coach Omero Martinez. 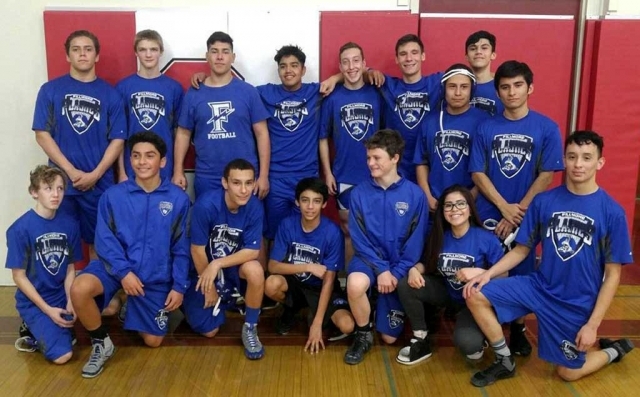 Pictured is this year’s Fillmore High School Wrestling team after their league match against Santa Paula, final results TBA. Lady Flashes traveled to Cate on Thursday 1-18-18 and lost 4-2. Fillmore was up 2-1 but could not hold the lead. Goals were scored by Ana Covarrubias and Aaliyah Alfaro assisted by Yarely Vasquez. JV won 3-0 behind another solid performance by the JV team for their second consecutive victory. Lady Flashes traveled to Santa Clara on Saturday 1-20-18 and came up on top with a 3-0 victory. All three goals came in the second half. 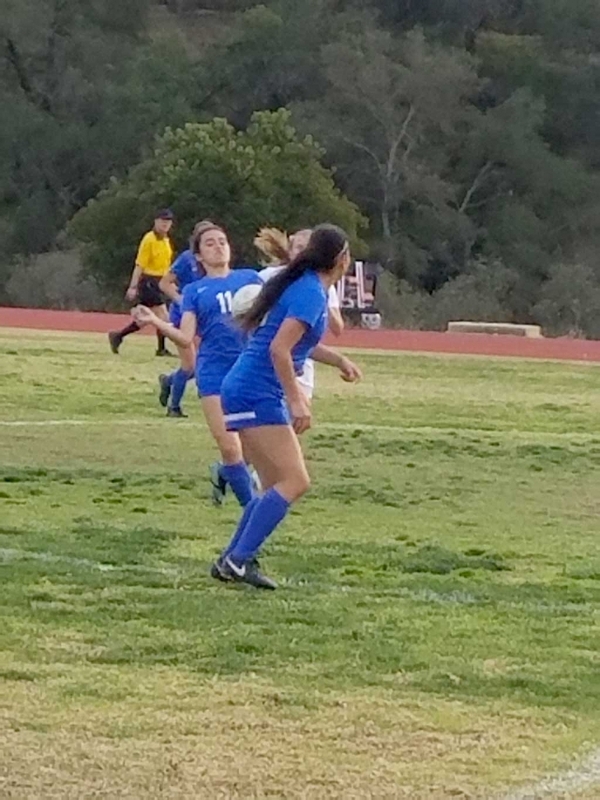 Goals were scored by Aaliyah Alfaro, Andrea Marruffo and Ana Covarrubias. Next home game will be on Thursday 1-25-18 Varsity only 6pm. Submitted by Coach Omero Martinez. 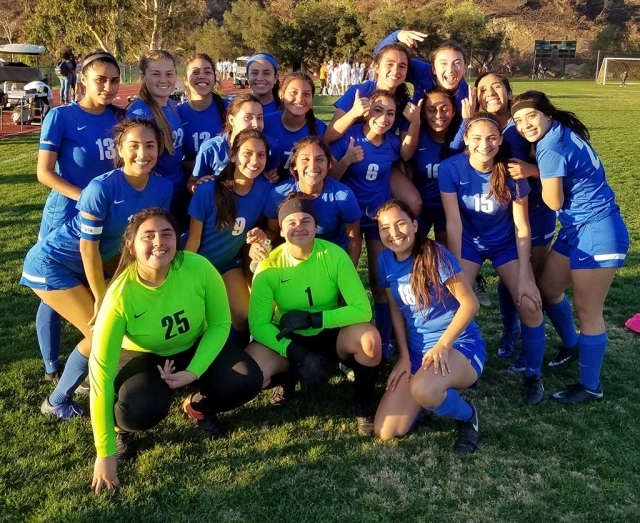 Pictured is the Fillmore High School Girls Frosh Soccer Team huddled together after a tough lose to Carpinteria this past week. Nicole Gonzales scored the lone goal. Lady Flashes had 15 shots on goal. 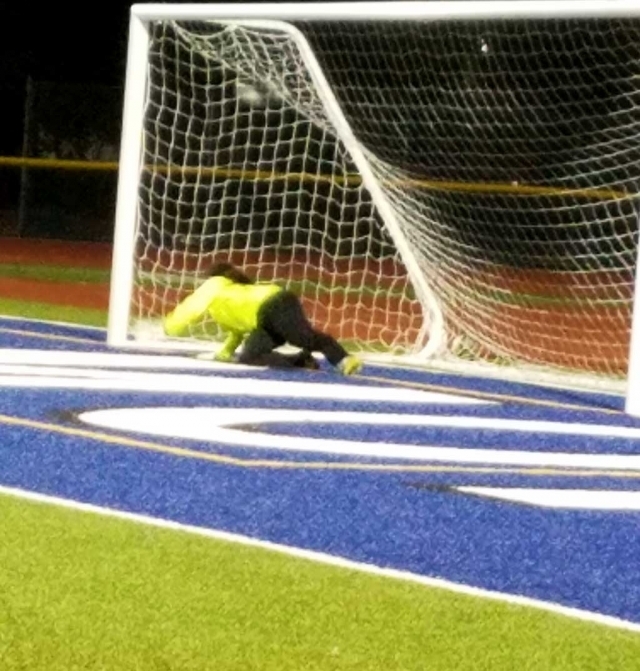 Goal Keeper Nely Lara had 7 saves. Photo courtesy Coach Omero Martinez. Flashes started slow, let opponent build a 1st qtr lead that doomed them, foul trouble cost then as well. Played well throughout, just came up a lil short at end losing the contest. Leading for Flashes Daniel Gonzales, 23 points, 16 rebounds, 1 steal; Noah Padilla , 13 points, 8 rebounds, 2 assists, 1 steal; Junior Maldonado, 9 points, 2 rebounds; Jake Saviers, 8 points, 8 rebounds, 3 assists, 1 steal ; Jordan Padilla, 6 points, 8 rebounds, 2 assists, 1 steal. Flashes were sluggish on offense in the first half, but picked it up in the second half to bring home the victory. It was a great team effort in the win, with special recognition to Jake Saviers, Junior Maldonado, Noah Padilla holding their leading scorer to just 11 points on the night. The Flashes were down 4 late, switched to a full court press, and scored 6 points in less than 10 seconds to take the lead for good. Late free throws sealed the victory on the road. The Fillmore Flashes are 3-1 in Frontier League, 5-11 overall. Flashes are home vs Foothill 1/24/18, then on road 1/26/18 vs Villanova. Submitted by Coach Omera Martinez. 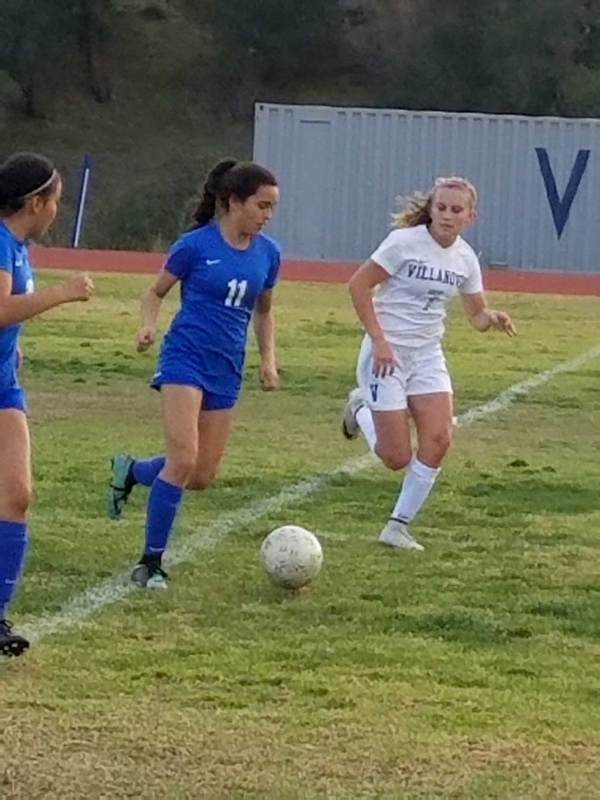 Tuesday, January 16th Fillmore Flashes Girls Frosh hosted long time rival Santa Paula, Fillmore lost 6-0. 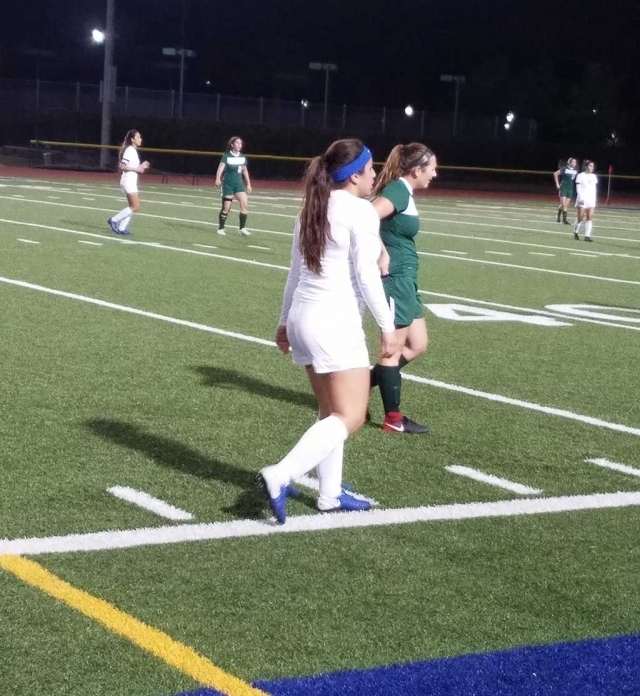 Also on Tuesday, Flashes JV hosted Thacher and defeated them 2-1, with goals from Isabella Vaca & Sophia Pina. Varsity also played Thacher had 20 shots on goal, but could not find the back of the net and fell short with a score 1-0 Thacher. The Flashes played well in the first half, only being down by 5 at halftime. The second half saw the Flashes struggle a bit to keep up the pace, eventually losing the contest. Leading for Flashes - Daniel Gonzales, 14 points, 11 rebounds, 2 assists, 2 steals, 2 blocks; Jake Saviers, 6 points, 5 rebounds, 1 assist, 1 steal, 2 blocks; Roy Esquivel, 6 points, 4 rebounds, 2 assists, 1 steal, 1 block; Junior Maldonado, 5 points, 3 rebounds, 2 blocks. The Flashes struggled in this contest , second game of a back to back. The boys had played a tuff Pacifica team the night before, and never really got going in this one. They fought the whole game, coming up short. Leading for Flashes - Jordan Padilla, 10 points, 2 rebounds, 1 assist, 1 steal; Junior Maldonado, 10 points, 3 rebounds, 1 assist, 1 steal; Daniel Gonzales, 8 points, 13 rebounds; Jake Saviers, 6 points, 5 assists, 1 steal, 1 block. Flashes finished the non-league season with a 2-10 record. The Flashes came out strong, leading by 3 at halftime, outscoring Villanova by 9 on the 3rd to secure a 12 point lead going into the 4th qtr. Flashes had to dig deep as they were outscored in the 4th by 8 points to hold on the Frontier League opener. Leading for Flashes - Daniel Gonzales, 23 points, 14 rebounds, 1 assist, 3 blocks, 3 steals; Roy Esquivel, 9 points, 4 rebounds, 1 assist, 1 block; Jake Saviers, 6 points, 9 rebounds, 2 blocks, 1 steal; Jordan Padilla, 4 points, 5 rebounds. Flashes 1-0 in Frontier League, 3-10 overall. The Flashes started the game and played the entire game with a sense of purpose. They were focused from onset of game to the end of game almost putting up 100 points in this Frontier League contest. They were up 22-12 after one, 47-26 at halftime, 69-38 after three, finishing 92-63. The Flashes defensive effort in the half court and full court was the difference, creating turnovers (20) and bad shots the entire game, and the offense feed off this energy the entire game. The boys used the tuff non-league schedule and experience to play a great all-around game to give their home town fans an entertaining Friday night in the gym. Leading for Flashes - Daniel Gonzales, 22 points, 10 rebounds, 4 assists, 1 block, 2 steals; Jake Saviers, 17 points, 13 rebounds, 6 assists, 1 block, 5 steals; Roy Esquivel, 13 points, 5 rebounds, 4 assists, 6 steals; Jordan Padilla, 11 points, 2 rebounds, 1 steal; Gregory Kraft, 9 points, 2 rebounds, 2 assists, 1 steal; Ian Morris, 7 points, 2 rebounds, 2 assists, 1 steal. The Flashes are 2-0 in Frontier League, 4-10 over-all. Flashes are on the road 1/17/18 vs Thacher, and also on the road 1/19/18 vs Cate, Next home game for the Flashes will be 1/24/18 vs Foothill Tech.